When Boing Boing Gadgets posted about this $13 robot hand music box, we immediately thought “OH EXPLOITABLE!”. Over the years, we’ve acquired quite a bit of cheap trash just operating under the assumption that we would turn it into something else. Most of our acquisitions are Woot‘s fault. Just this morning we were dismayed to find out that the purveyor of cheap electronics had already sold out of animatronic Elvis heads. Now that would have been fun. We’ve purchased things like Tony Hawk helmet cams, jumbo remotes, Bluetooth headphones, Gyration mice, IMFree chatpads, and many other items of questionable use thinking that some day we’d use it. How about you? 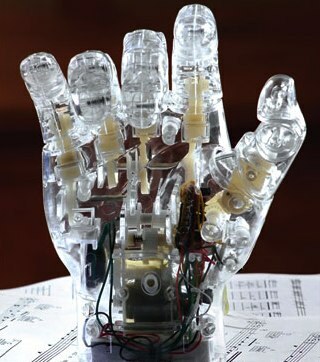 What sort of irrational purchases have you made and what would you do with a $13 mechanized hand?